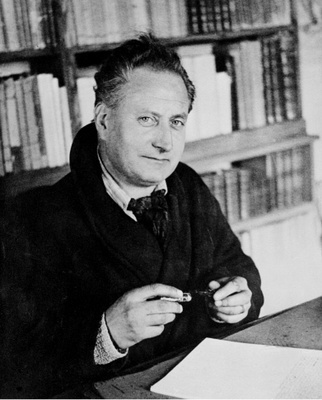 Jean Giono (1895 – 1970) whose birth anniversary we mark on 30 March was one of the most original French advocates of non-violence. Giono, a pantheist philosopher, novelist of rural life, and in his later days, a movie-maker, had a fame in the wider public even among those who opposed his nonviolence. André Malraux, who was both a great novelist and a man who participated in war, wrote that the three best writers of his generation were Henri de Monterlant, Jean Giono, and George Bernanos. Jean Giono was born and died in Manosque — a town in the mountains above Aix-en-Provence which, ironically, has now become an area of vacation homes for the well off who can no longer find space on the Cote d’Azur. In Giono’s time, it was an area of small farmers and shepherds who were the protagonists of Giono’s novels. One of the most moving of Giono’s books Le Serpent d’Etoiles (1933) has as its theme a shepherd looking at the Big Dipper. Thus Giono is often considered a “regionalist” writer, but, in fact, he uses the background of the region where he always lived (except for his military service in World War I) for dealing with broader, cosmic issues. Giono’s family names from a north Italian grandfather whom he never knew. The grandfather was a carbonaro, a member of a secret society that worked against the richlandholders and the different authorities in Italy prior to the 1860 unification. The grandfather, accused of murder, had crossed the mountains into an isolated partof France where people by tradition were against authorities and seldom asked questions about a person’s background. Giono’s father was a shoemaker who carried on his father’s anti-authoritarian tradition. He became a Protestant in an area where there were no Protestants and left an interest in the Bible to his son. Giono’s father died when Giono was only 15, and so Giono left school. He is basically an autodidact, influenced by his father’s reading of the Bible and his reading of Homer. Homer was his basic teacher, a writer that he would continue reading often during his life. His only other intellectual influence, but only after the Second World War, was Nicolo Machiavelli, that observer of political life. Influenced by Homer to look for the activity of the gods behind human actions and influenced by the open mountain area where he lived, Giono saw Pan at work, a Pan who followed in the procession of Dionysus but Dionysus was too powerful a god to be dealing directly with the small farmers of the area. Pan was more appropriate, and Pan is the chief protagonist of the first three novels of Giono – novels which were designed to be a trilogy before he started to write them. Giono’s first(and I think best work) called Colline (1926) in French and published in English as Pan: Hill of Destiny followed by Un de Baumugnes (1929), Regain(1930) . Giono believed in what is now often called ley lines – the energy currents of the earth that are more powerful or closer to the surface in certain areas than in others. On the outcroppings of these ley lines, the gods and the nature spirits are present and so interact with humans more directly. Pan, however, is not a gentle nature fairy, and those who follow him are also in danger. Nature, for Giono can also be the sudden storm, the rock slide on the mountain side, the wild stampede of the sheep. The south of France is not all sun. In this, Giono differed from Marcel Pagnol who used only the human side of Giono for his films without the Panic element always in the background. As the clouds of war started to gather in the 1930s, first in Italy which had always interested Giono, and then Germany, Giono started to gather around him people who were opposed to war and who wanted a “return ot nature”, to a rural, simpler life. They started to meet each summer in a small village higher in the Lure mountains than Manosque, Contadour, They published their considerations in a journal, the Cahiers de Contadour. Giono’s pacifist writings led to his arrest for “anti-military activities” in 1939. He was released without a trial after two months as the French became more involved in fighting, and there had been no massive refusal to fight on the part of French troops –at least not as a result of having read Giono’s writings. Ironically, Giono was re-arrested in 1944, probably to protect him from the savage revenge killings that followed the liberation of France, but officially for having been one of the ideological “fathers” of Vichy France. In effect, the Vichy government had used many of the themes of Giono’s writings, some Vichy administrators because they had read him, others because the themes were also part of traditionalist Catholic thought which influenced Vichy: the return to the land, the vision of the small farmer as honest and satisfied by the simple life, a hostility to the cities where there lived Jews, Socialists and trade unionists, a sense of solidarity among small farmers and their emphasis on “family values”. Giono was again not brought to trial because he had had no direct influence on the propaganda administrators of Vichy; however the image of a pro-Vichy writer lasted until the early 1950s when there was a general consensus in France to “forget” the war and the Vichy government. Giono, however, then left the active political ideology scene. He turned to reading Machiavelli who seemed to him to best describe the narrow self-interested domain of politics. He concentrated his later novels on the period of his grandfather, when Italian activists took refuge in France and when a French deserter from military service took refuge in Italy. A less political but pantheist Giono was re-discovered in France after May 1968 and its strong current of “back to nature”, Gaia-the spirituality of the earth.